Please Note: Due to our high volume of business, at this time Lucky's is only accepting 1999 and newer FORD vehicles for repairs. Gauges: Should be able to monitor EGT, Fuel pressure,Voltage (protect that Ficm) Boost, Oil temp, Coolant temp, Trans temp. Cooling System: Flush out that old gold coolant, use an extended life coolant with out any silicate that can plug up your oil cooler. Look into a coolant filtration system as soon as possible, There are many great systems avalible. Injectors: There are some oil treatments out there that say they can help with stiction. Seems like once it starts its too late, watch your fuel pressure and voltage and keep on top of your service, oil change every 5000 and fuel filters every 10,000, and use motorcraft filters always. 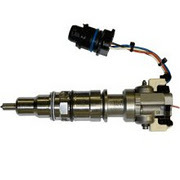 High Pressure Oil System: Ford has updated the dummy plugs that go in the injector oil rails and also the feed tubes that connect the branch tubes to the oil rails. They also have an updated connection for the HPOP to branch tube that gets rid of that faulty STC connection.These updates are for the 2005-2007 model year Powerstrokes. Fuel System: Any time an injector fails and needs to be replaced the fuel pressure regulator spring should be replaced and fuel pressure checked, dead head fuel pressure at secondary fuel filter housing should be a min of 50 psi. Also it is very important that a combustion gas test be done on both banks unless you are planning on replacing all 8 injectors. Head Studs: The factory head bolts seem to have an issue with stretching, there are many theories why but there is only one true fix, head studs by ARP. As far as what head gasket to use i think that there are many very good options as long as the heads are checked for flatness and cracking. By fords flatness guidline which is very different than most machine shops methods. Copyright 2011 Cash Diesel Repair, LLC All rights reserved.